Malcolm Reed is, by far, one of my all-time favorite Star Trek characters. This character is, of course, Star Trek: Enterprise canon. 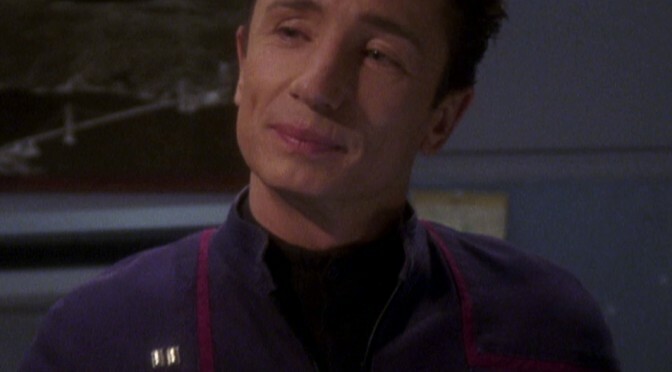 The actor, Dominic Keating, is British (he’s from Leicester), but the character is from Malaysia. Repressed, uptight and a lover of big guns and even bigger explosions, Reed was rumored to be the first regular gay character. However, according to Keating, the rumors were Internet hype more than anything else, and homosexuality was never intended to be a part of the portrayal. This has not stopped a lot of fan fiction writers from giving him a slash angle. I do not. Instead, since all of his relationships and possible relationships are straight, I write him as completely heterosexual. As in canon, Reed is played by actor Dominic Keating. Canon states that Reed is repressed and shy around women. He’s also very competent at his job, possibly the most competent person behind T’Pol. Self-sacrificing to a fault, Reed is uncomfortable fraternizing with his captain, and feels that the relationship should remain at arm’s-length. Furthermore, Malcolm is afraid of water and is the ship’s chess champion. As I have written him, he also has a fondness for Scrabble and various word games and puzzles, enjoying competition but also working to improve his mind. He’s an avid reader (some of that reading is canon), and is particularly fond of Jane Eyre. Whether he sees himself as Rochester is yet to be determined. A cautious lover and a natural pessimist, Malcolm is a bit afraid of rejection and has a bit of dysfunction at times. He keeps to himself, which tends to make relationships problematic at best. But when he meets someone and he likes her, he latches on rather quickly. However, at the beginning of much of my fanfiction (and in keeping with canon), he tends to fall for women who are either thoroughly inappropriate for him or are utterly unattainable, a fact that he acknowledges in Concord and Together, in particular. As I write Malcolm, he has two major relationships which define him. With Pamela, Malcolm feels he may be falling in love, but she pulls him back and tells him, no, you’re mistaken. He finds it freeing when he realizes that she’s right. But Pamela also stretches his limits, and loosens him up. A part of that is due to her prowess and her proclivities. He finds himself enjoying a bit of naughty bedroom play, and participates in some, but not all of it. At the end of Intolerance they part, assuring each other that they will become, essentially, Friends with Benefits. With Lili, the relationship is considerably stronger and more loving. Malcolm finds that he can be a lot freer with her than he has ever been with anyone before, even Pamela. He fulfills the destiny that was denied him in the original, canon E2 episode, and becomes a family man when Lili gives birth to Declan (Temper, Fortune). Initially, in Reversal, Lili is denied him, as she goes with Doug. In later life, he and Lili marry, an event prepared for in Equinox and then shown in Fortune. Their later married life is briefly shown in The Rite. Lili also pairs with him in the E2 stories I am currently writing. In one scenario, they have a daughter who they name Pamela Morgan. In another, in keeping with canon, they do not have children. In Concord, Malcolm pines for Charlotte but never truly attempts to win her. Instead, seeing a picture of Lili after his encounter with Charlotte, Malcolm experiences an eerie sense of déja vu. Malcolm’s behaviors work well with music. In Intolerance, his relationship with Pamela is covered by Love is Strange but also Be My Baby. In Together, his initial theme is The Style Council‘s Wanted, with its message of unattainable longing. The reader is told – Malcolm has been holding back, and there is someone he is pining for. When he and Lili hook up, the musical theme, shared by them, is A Flock of Seagulls‘ Wishing (If I Had a Photograph of You). His disastrous reunion with Pamela is evoked with Lady Gaga’s Bad Romance. By the time the action shifts to Temper, the music changes, too, to Paul Young’s Every Time You Go Away. His final theme, in Fortune, is evocative of their wedding. It’s Bruce Springsteen’s Prove It All Night. could the knave unlock this treasure? Malcolm Reed has a canon counterpart, who I name Ian and kill off before Reversal. But Ian has a rather rich afterlife, particularly in Equinox and the E2 stories. I’ll cover him in a separate entry. For a canon character with a comparatively sketchy background, I’ve been happy to fill in the blanks. And I hear his voice better than any of the other canon characters, except perhaps for Jay Hayes. I could tell a thousand stories about Malcolm Reed. I feel I have merely scratched the surface.